Teaching at Forest Fields Primary and Nursery School! At Forest Fields, we know that competence in reading is the key to independent learning and it is therefore given the highest priority, enabling the children to become enthusiastic, independent and reflective readers. Success in reading has a direct effect on progress in all other areas of the Curriculum and is crucial in developing children’s self-confidence and motivation. At Forest Fields we use the Read Write Inc. and Fresh start schemes to teach reading. accelerates children’s literacy learning leading to improvements in attainment, both in relation to the Phonics Screening Check and throughout the school. All teachers and support staff are trained to teach within the programme. All work together to plan, deliver and moderate the teaching of literacy in order to ensure that expectations are high. When children have completed the Read Write Inc. scheme, they will have gained the skill of decoding and reading fluently and will be taught one hour of English lessons which will be a combination of deep reading and high quality writing. These lessons will ensure that we deepen their understanding by questioning and working on children's comprehension skills. Each classroom has a range of 'real' books as well as access to our reading schemes. and talk about a range of fiction, poetry and non-fiction. Reception children begin to learn the first 31 phonic sounds from the ‘Read, Write, Inc’ phonics programme when they enter Reception Class. This is taught at a rapid pace: children are introduced to 1 phoneme per day throughout the first term. The teaching of this is multi-sensory and active using the wider school environment such as the Early Years outdoor area to ensure purposeful learning is taking place. Opportunities are continually provided to develop children’s CLLD skills in adult-led and child-initiated activities every day, with a focus on speaking and listening. The Read Write Inc. sessions will lengthen as the year progresses in preparation for Key Stage 1. Letter sounds are sent home as they are introduced in class to consolidate learning and to keep parents and carers up to date on the progress being made in school. Children are continually assessed during and at the end of this period and if secure move onto set 2 and 3 sounds as appropriate. Intervention activities will be in place for those children who are not secure with the Set 1 sounds to target any gaps in phonic knowledge so far. Environments will be vocabulary-rich, inviting and well resourced, allowing children to build on their vocabulary and confidence in using increasingly sophisticated sentences. Children will take home Read Write Inc. books when they are at the required level of the programme and will always take a story book home to share with adults to develop vocabulary and learning attitudes towards reading. In Year 1, the teaching and learning focuses on building on the skills learnt in the Early Years Foundation Stage. At Key Stage One the emphasis is on developing pupils’ interest and pleasure as they learn to read independently and with confidence. Children focus on words and sentences and how they are put together to form texts. They bring meaning to the texts they read and say what they like and dislike about them. Adults model a range of strategies including sentence structure, grammar and word recognition in context. At the end of Key Stage One most children will be developing their comprehension skills. 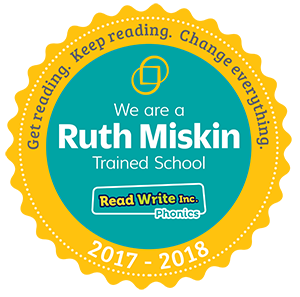 We continue to use the Read Write Inc. scheme for reading, ensuring children in Key Stage 1 are taught at their own pace though a progressive synthetic phonics programme to the establishment of key composition and comprehension skills. As the children complete the Read Write Inc. programme, they are taught in a separate group focusing on the acquisition of curriculum skills- Children are introduced to and explore a variety of different genres. Teachers will model reading strategies during shared reading sessions, whilst children have the opportunity to develop reading strategies and to discuss texts in detail during guided reading sessions. In KS1 children also have the opportunity to read 1-1 with an adult at least once a week. As the children move through the school, opportunities to read independently for a sustained period of time are afforded to them. As in the EYFS, children who are on the Read Write Inc. programme will take the PREVIOUS book taught, home to read. Emphasis is on their ability to fluently read the books with expression and good reading habits, supporting their development of reading comprehension. They will also choose a picture book to take home. All classes in Key Stage 1 will enjoy a class story each day. Children behind in their reading, or making insubstantial progress, will get daily phonics interventions where they learn sounds and practise reading the words. Children may also be part of small groups revising ‘gaps’ in their knowledge. There will be support for children new to English, delivered by EAL TA’s which is closely linked to core learning in English, Phonics and mathematical language. Reading comprehension is taught daily, focusing on specific reading-skills whilst reading across the curriculum focuses on the understanding of key terms, knowledge and vocabulary. Key Stage 2 children, as long as they have completed the Read, Write Inc. scheme, take home a book banded book. This will be issued according to their reading level. Opportunities are given to children to read independently each day. Reading is recorded in home school diaries and checked weekly. Expectations are also given to children that they should read at least 10 minutes of their reading book at home each night and record this in their diaries. Children use appropriate book-banded books to ensure that their reading book is accessible yet challenging. Read Write Inc. and Fresh Start is used as an intervention for children who have not yet met the expected standard in their understanding and application of reading. These children take home specific books from the scheme, plus a picture/chapter book to share at home. Additional sessions are given to support children who are new to English which are linked with the Read Write Inc. and Fresh Start scheme, including Global English. Children with Special Educational Needs may have additional class support, work in small groups and one-to-one sessions, along with further developing language and communication skills.